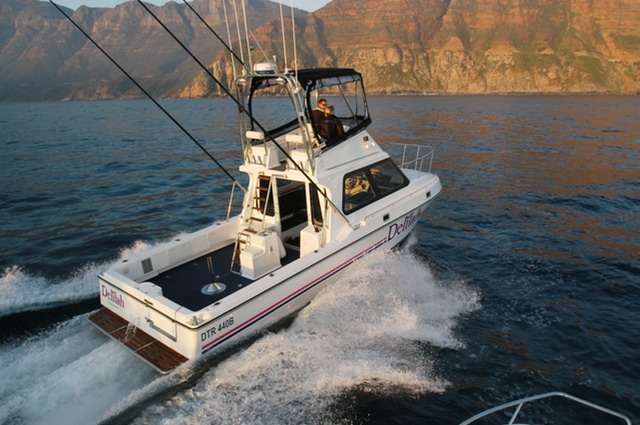 This boat, has been engineered to safely endure the often extreme sea conditions experienced off The Cape of Storms.The full cabin provides excellent protection from the elements for the crew whilst on extended offshore outings, and alternatively provides comfort and versatility for over night cruising and social entertainment . 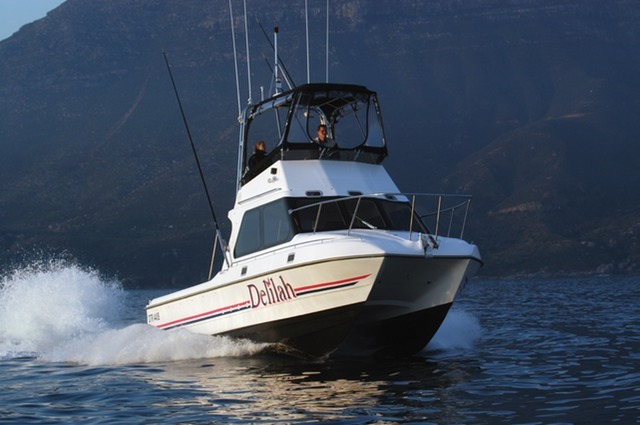 The catamaran hull provides excellent stability with a dry and comfortable ride, and is available with either inboard diesel engines, or with 4 stroke outboard engines. 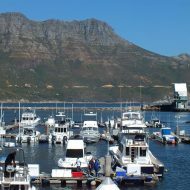 The cabin, which houses the main control station, offers comfortable seating with excellent vision to the aft deck and a clear 360 degree view of the surroundings through toughened tinted glass.The galley is located adjacent to the seating area. 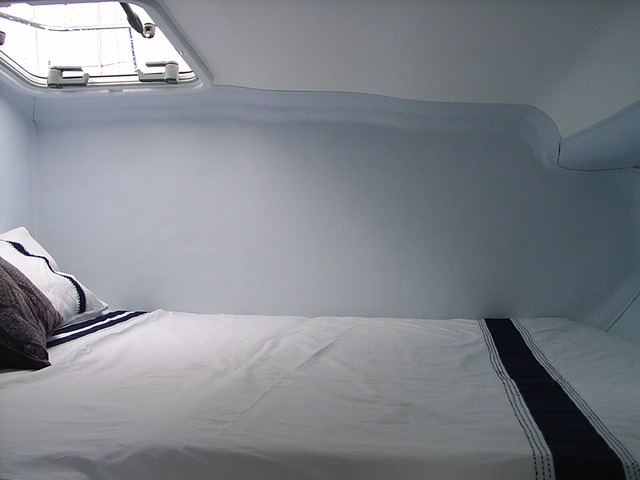 Forward of the seating and control station is the main double bunk and fully enclosed head. 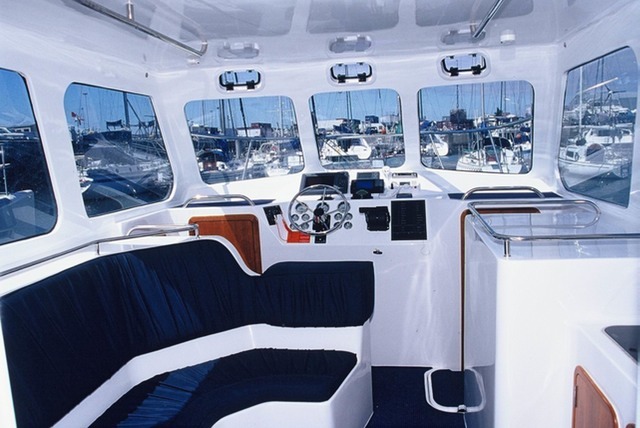 The large fly-bridge houses the dual control station and has two full length bench seats suitable for sun-tanning or lounging. Two below deck storage hatches 650l each. 6 x Large hatches located on gunwales for storage. Pressurized raw water wash down system with hose and nozzle. Retractable fresh water shower handset mounted on swim platform. Transom door to swim platform. 2 x Access hatches to fuel tanks. 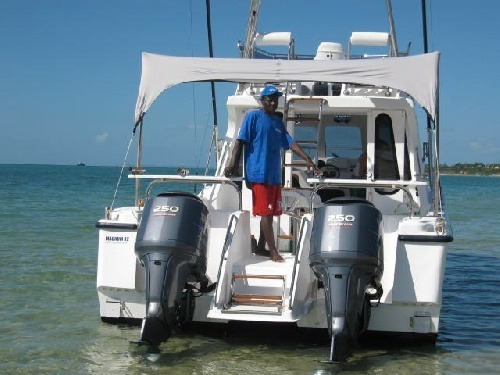 2 x Access hatches to through hull mountings and bilge pumps. 2 x Automatic bilge pumps for hull drainage. 2 x Manual bilge pumps for emergency hull drainage. 2 x Manual bilge pumps for emergency drainage of below deck storage hatches. 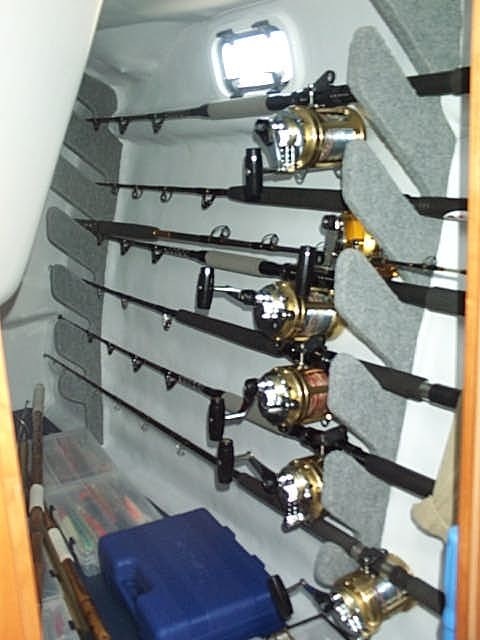 Large centre deck box for storage includung an insulated bait compartment. Electronic engine controls and engine instrumentation. Access to Port and Starboard Fwd. cabins/bunk area through timber doors. Access to Port Aft bunk/ storage area through timber door. 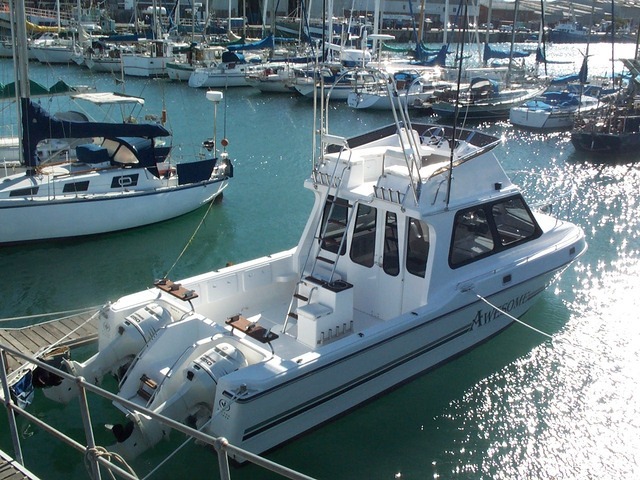 Enclosed marine head with basin, for fresh water tap and hand shower complete with storage locker, mirror and access to toilet through-hull fittings and automatic bilge pump. Port and starboard storage lockers with timber lattice doors. L-shape bench seat located on Port side. 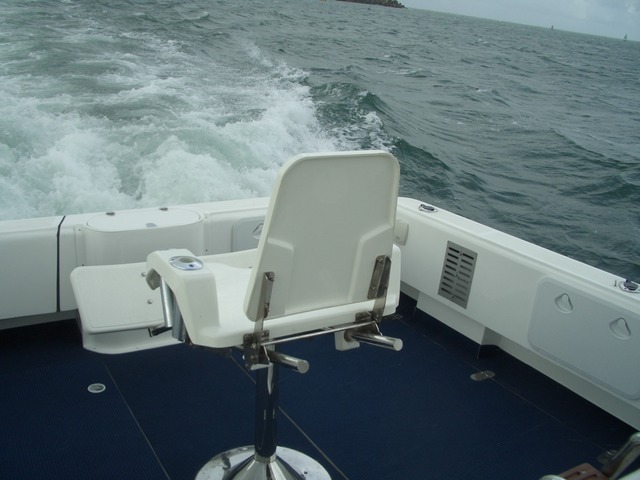 Bench seat located on Starboard side. Galley area with utensil drawer unit, cupboard, 12-volt fridge, 2 plate gas stove located on Starboard side. Basin with fresh water tap located on Starboard side. Strategically placed handrails located overhead and throughout cabin. Opening ventilation ports in head, bunk and saloon areas. Escape hatch located in forward cabin. Communication hatch opening to fly bridge. Sliding doors for security and weather protection. Upholstered bench and bunk cushions colour matched to Owners choice. Port and starboard upholstered benches, with 4 storage lockers. 2 x Aluminium fuel tanks constructed to marine specifications, complete with full baffles, inspection plate, isolating valve, fill, suction and vent lines. Useable volume per tank approx. 350litres. Tank can be dipped or drained through access port in inspection plate. Remote mounted level gauges, are located at main control station. 2 x Heavy duty 100amp Delco engine start batteries with isolating switches. 2 x Heavy duty 100amp Delco house batteries with selector switch. 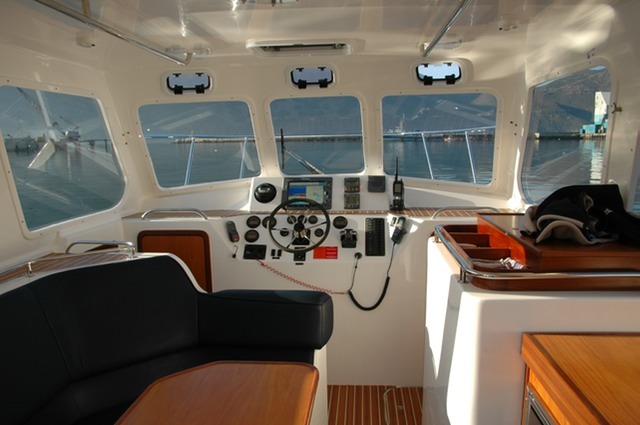 Low level anti glare cockpit lights on aft deck and on flybridge. 2 x spreader lights to illuminate aft deck. All fittings are marine grade 316 stainless steel, welded and hand polished. 6x gunwale mounted rod holders. Trolling bars with 3 horizontal rod holders each. 6 x Rod holders, for storage, mounted across radar arch base. 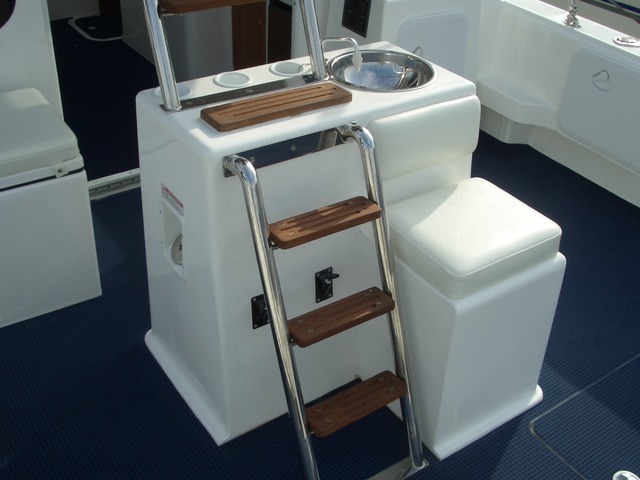 1 x Flybridge access ladder. 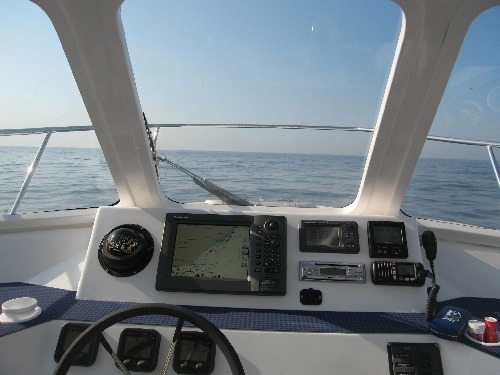 1 x Flybridge screen protector with side rails and backrests. 1 x Boarding ladder mounted on swim platform. 1 x 70 litre fresh water tank. Fixed magnetic compass mounted at main control station. Antifoul paint applied to hull. Full safety equipment for 10 persons, required to satisfy SAMSA category B > 9m. 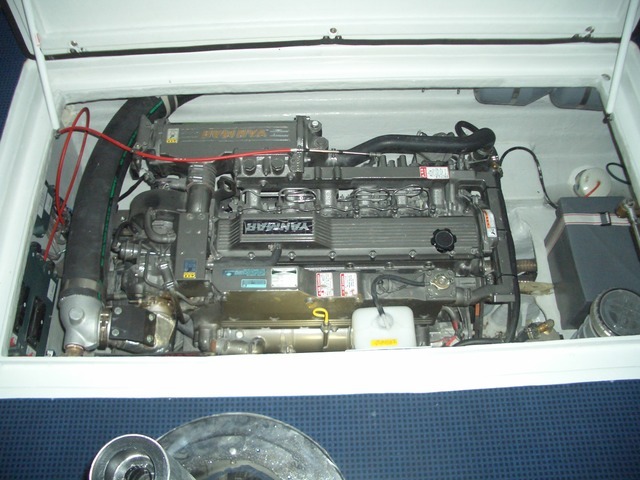 Twin Yanmar 6 cylinder diesel engines driving fixed propellors through close coupled V Drive gear boxes. 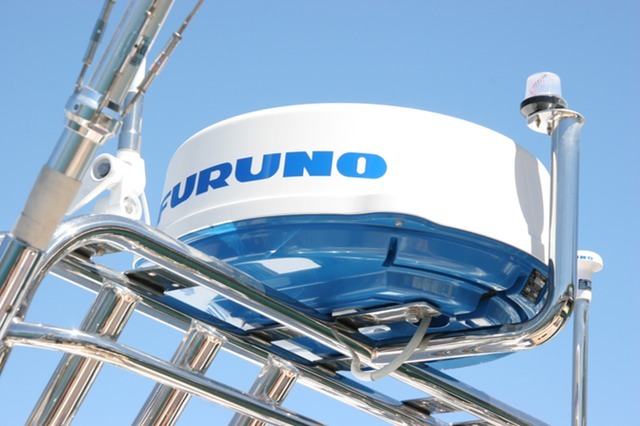 2 x Removable, glassfibre, insulated cooler boxes, with upholstered lids, located on aft deck. 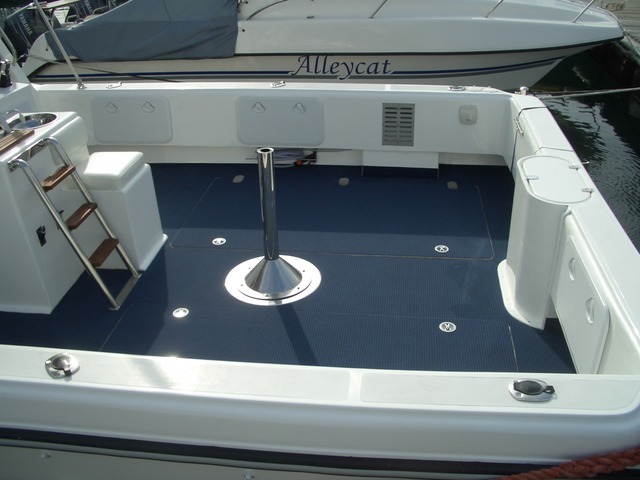 Flotex Carpet – Aft deck. 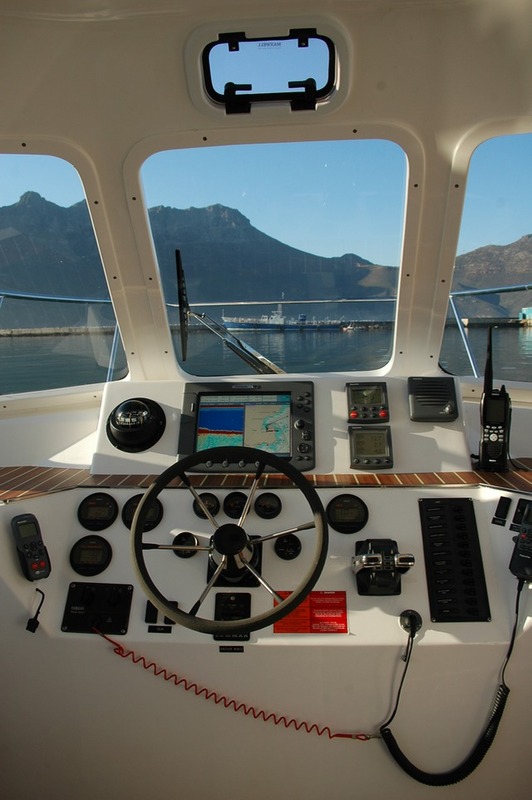 Simrad AP16 Autopilot with remote control for fly-bridge.